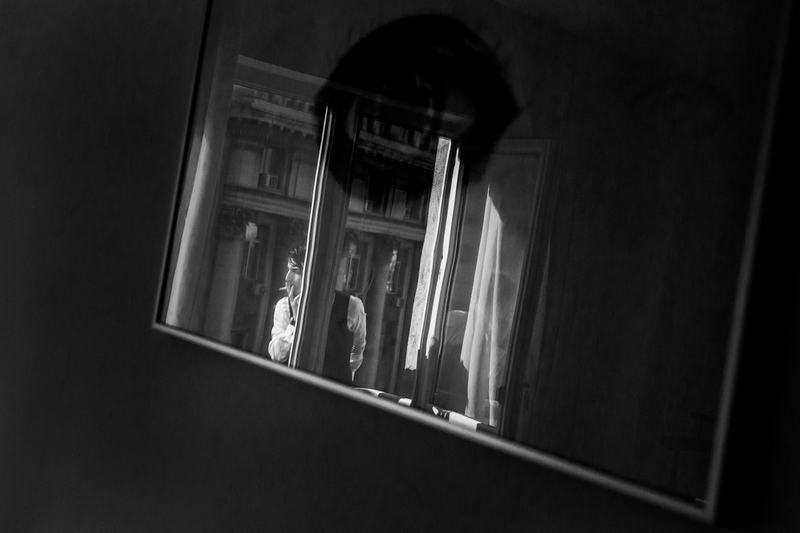 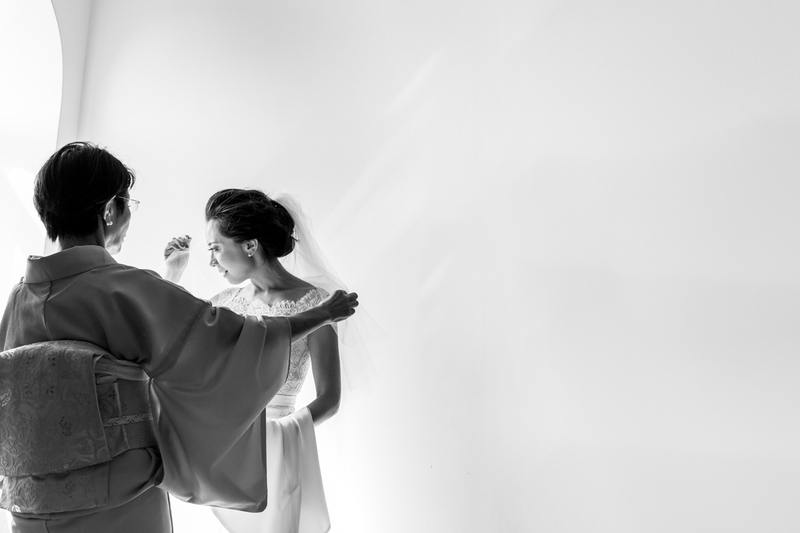 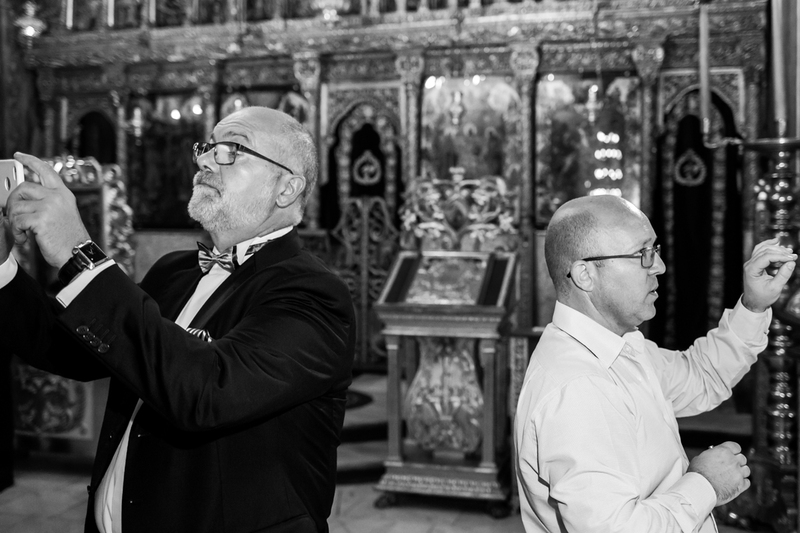 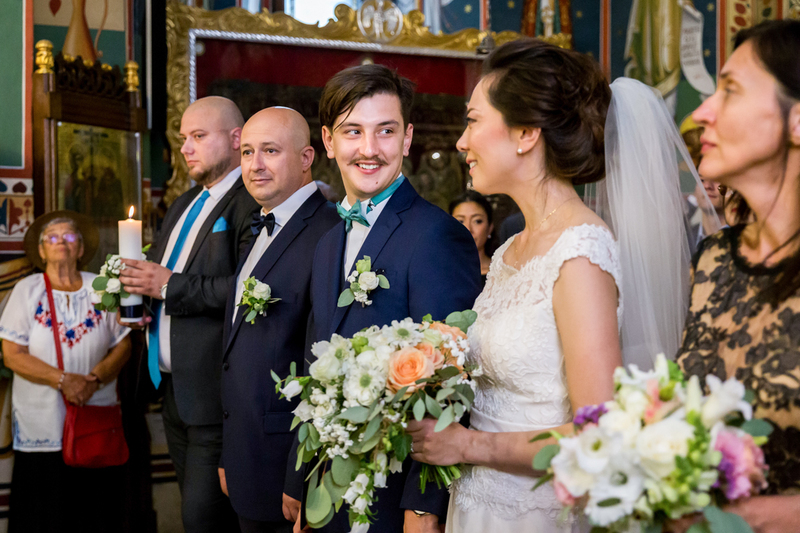 We just love shooting weddings, no matter how difficult it might get sometimes and no matter how long it takes (please note that the average Romanian wedding spans for about 16 hours). 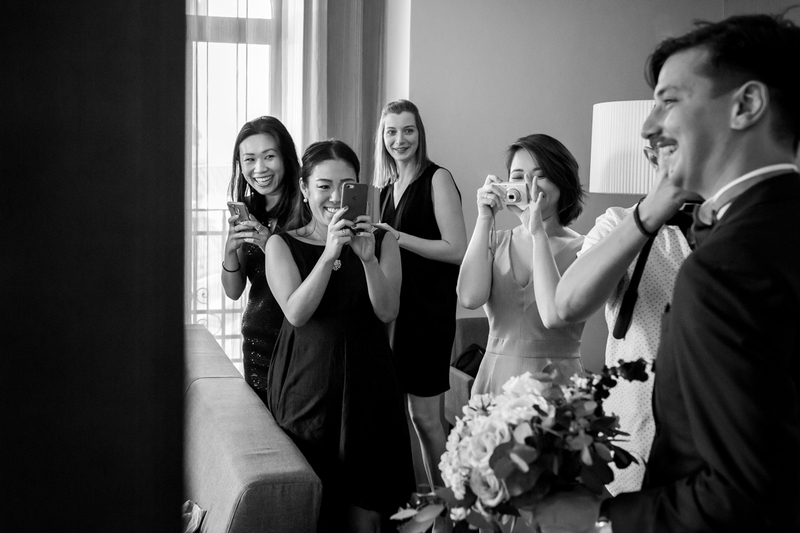 And that is because we are crazy about people and their stories. 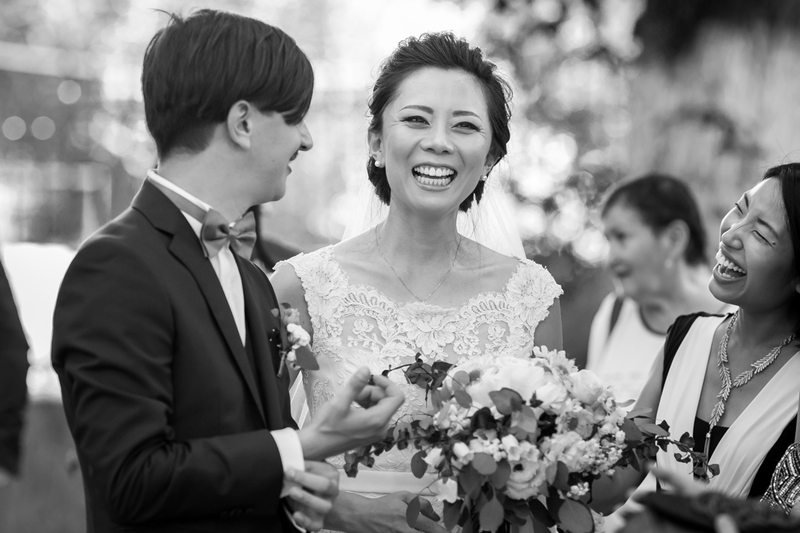 We have the opportunity to capture incredible love stories and to meet amazing people, from the most diverse social, cultural or geographic backgrounds. 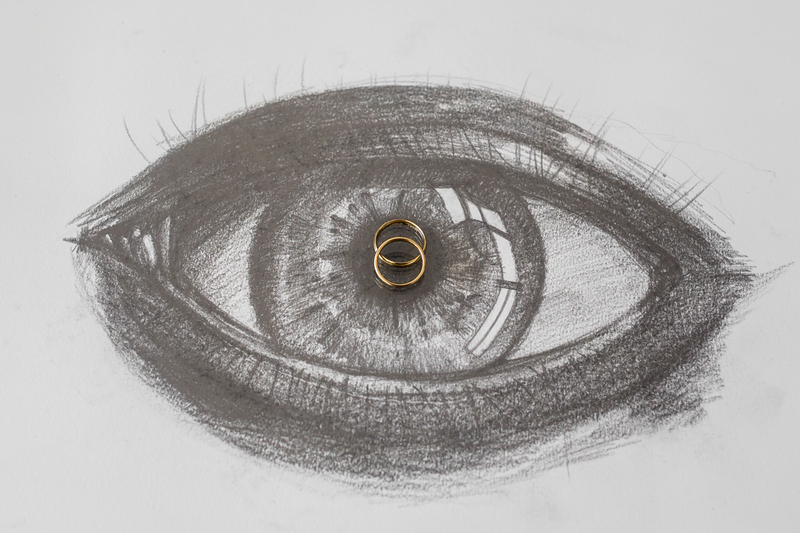 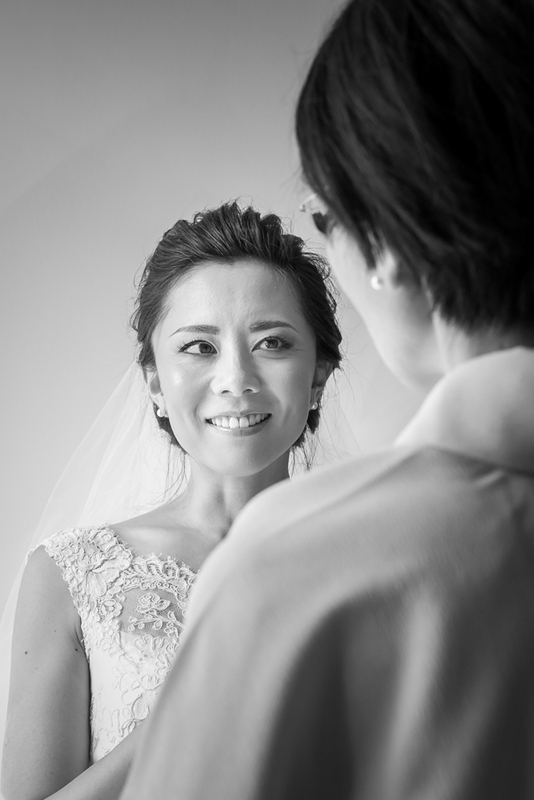 This is a story that moves us deeply. 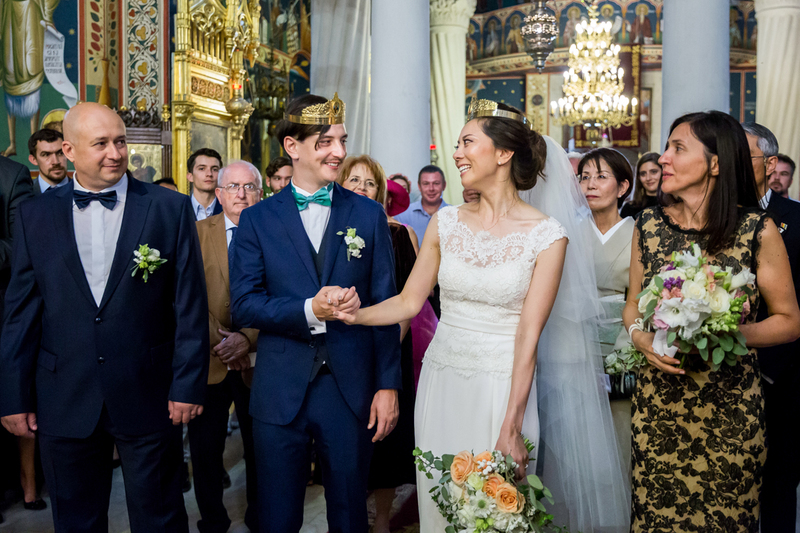 It is a love story that goes beyond religion and culture barriers. 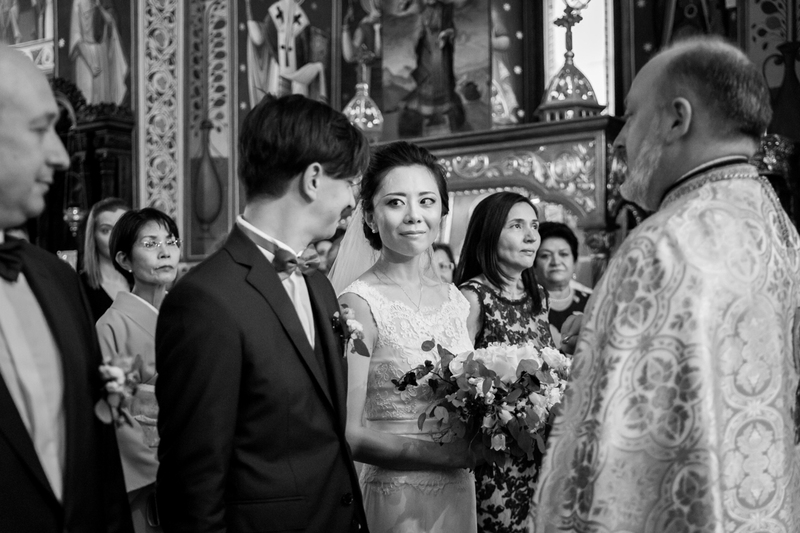 Out of love for Ștefan, Yu was baptized and converted to Eastern Orthodoxy, becoming Iulia. 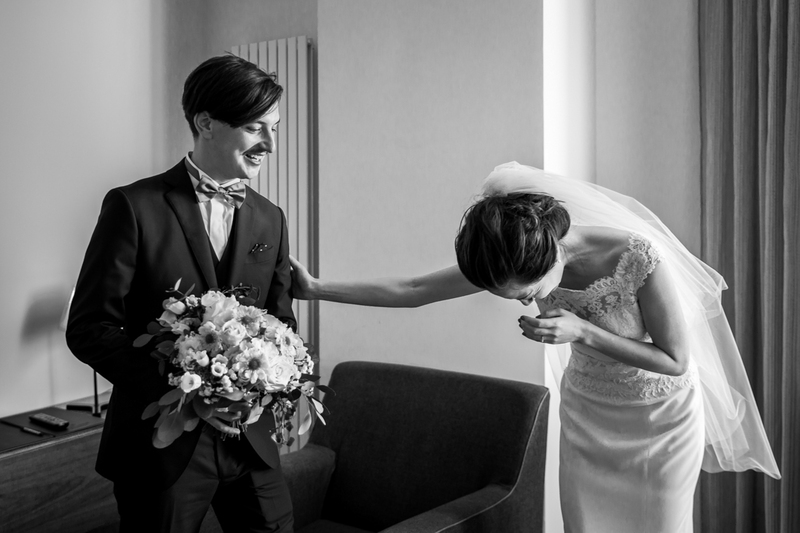 What better proof of love would a man need? 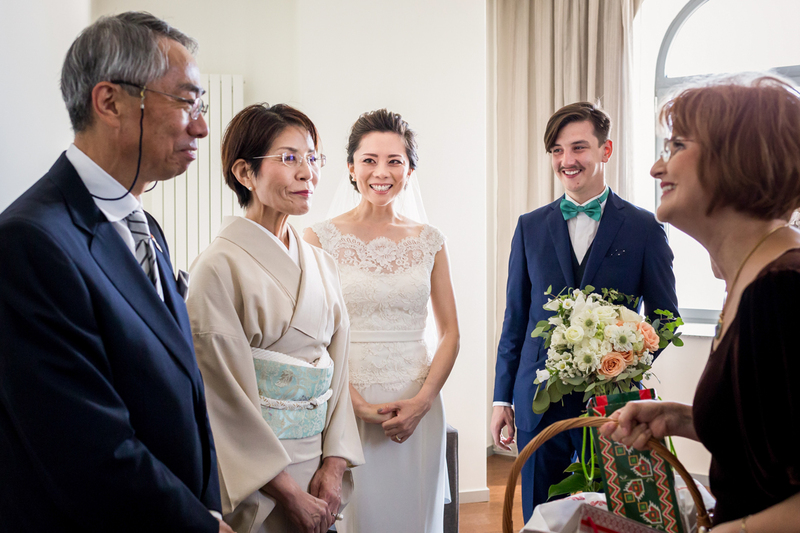 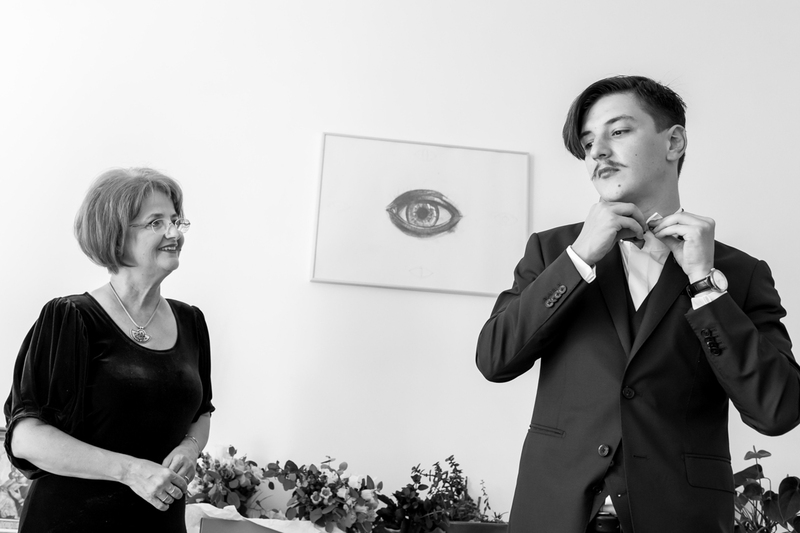 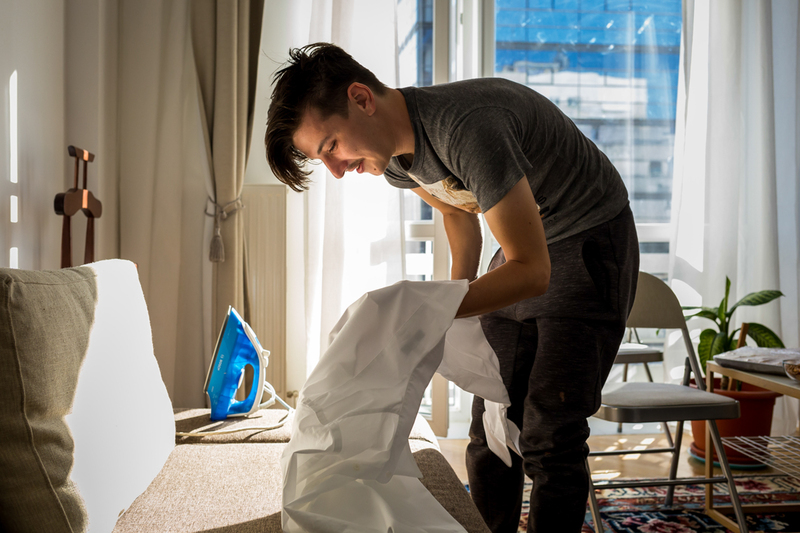 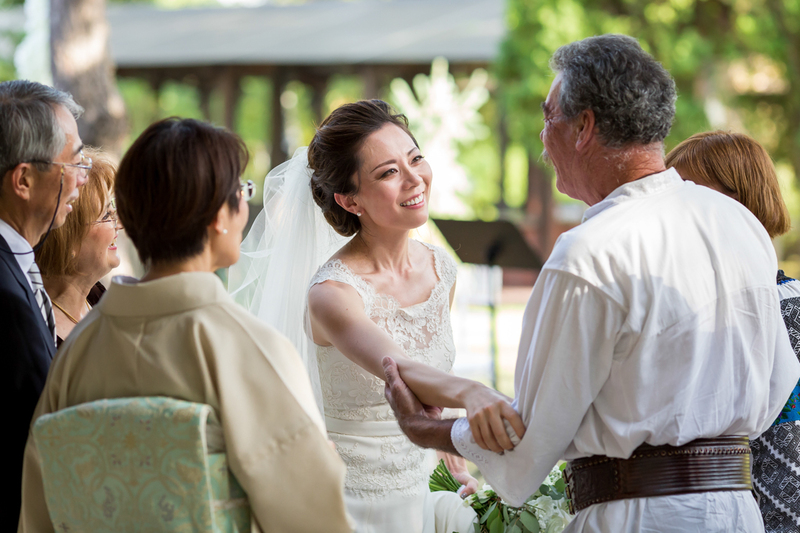 The couple met when Ștefan took his first trip to Japan for an internship, while in college. 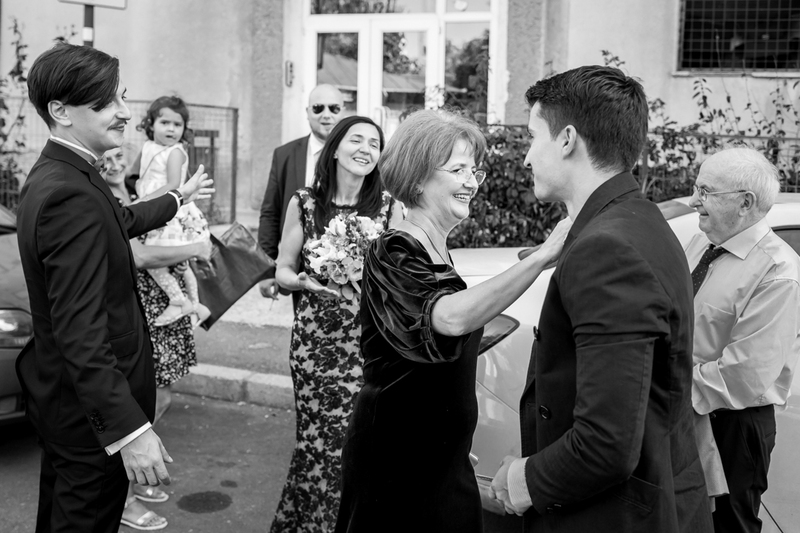 They liked each other so much, that they spent a vacation in Romania together. 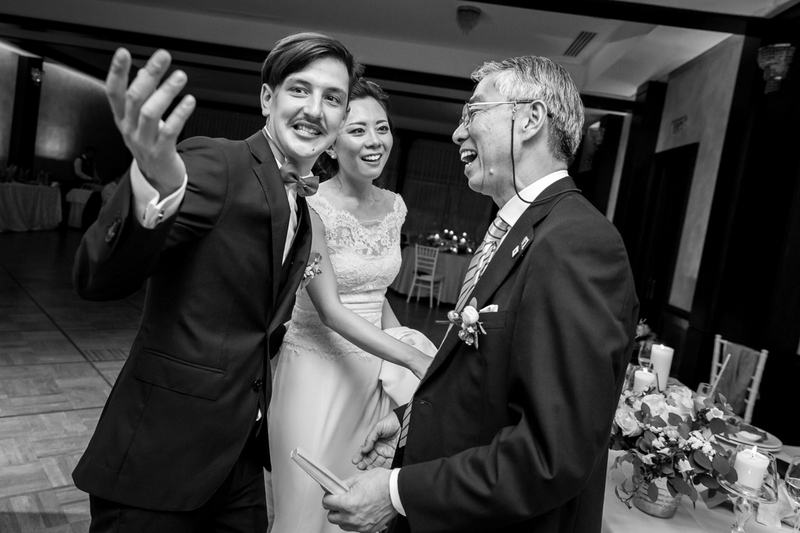 After graduation, Ștefan got another internship in Japan. 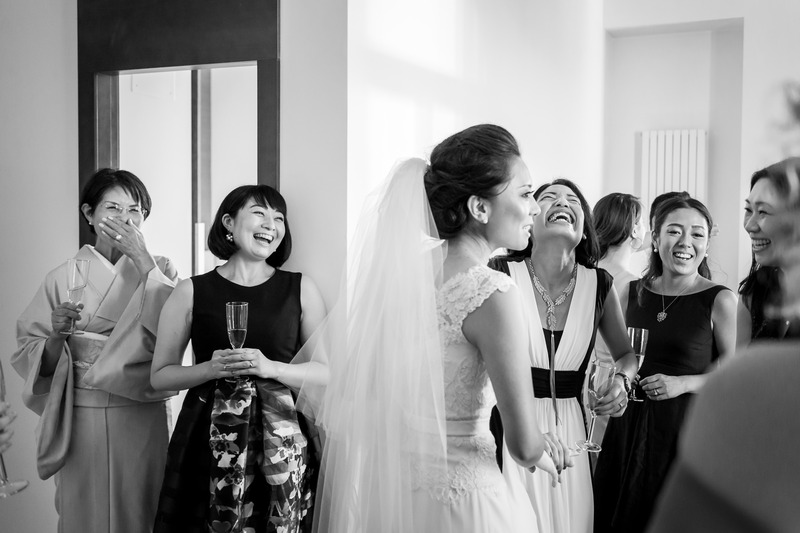 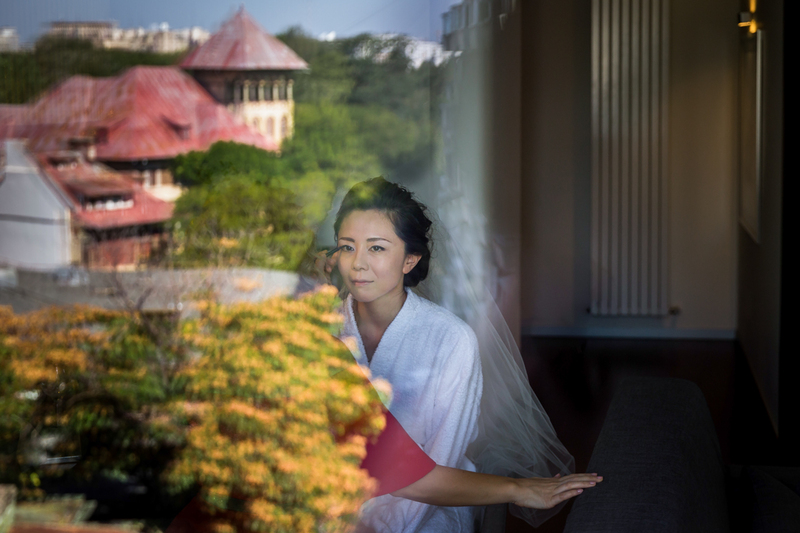 Then came a steady job for an architecture firm based in Tokyo and their wedding was only one step away. 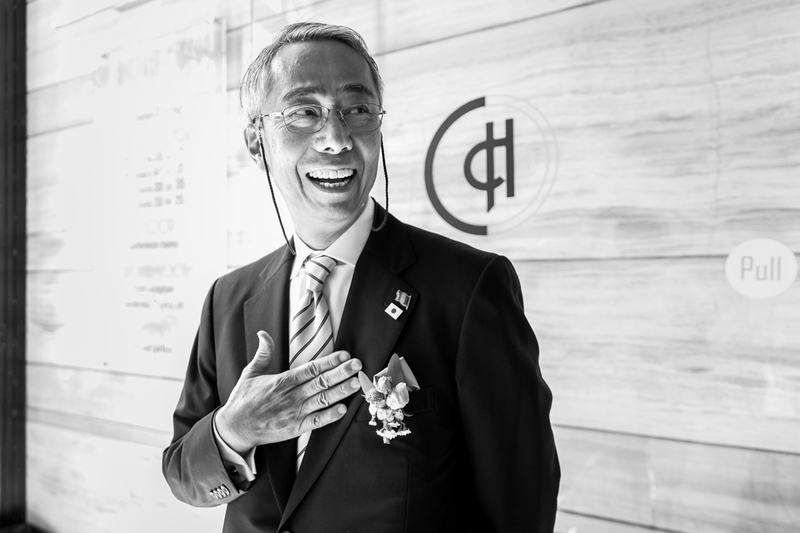 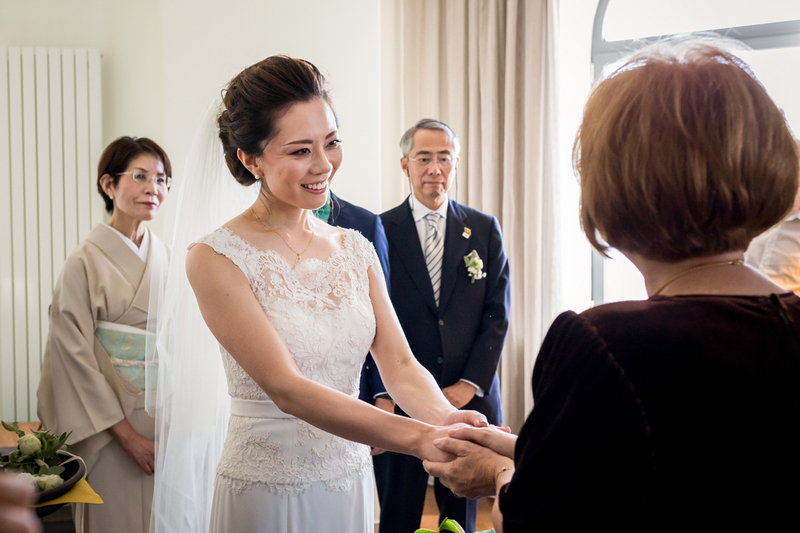 Actually, more than one step… First, there was the civil ceremony at the Tokyo City Hall. 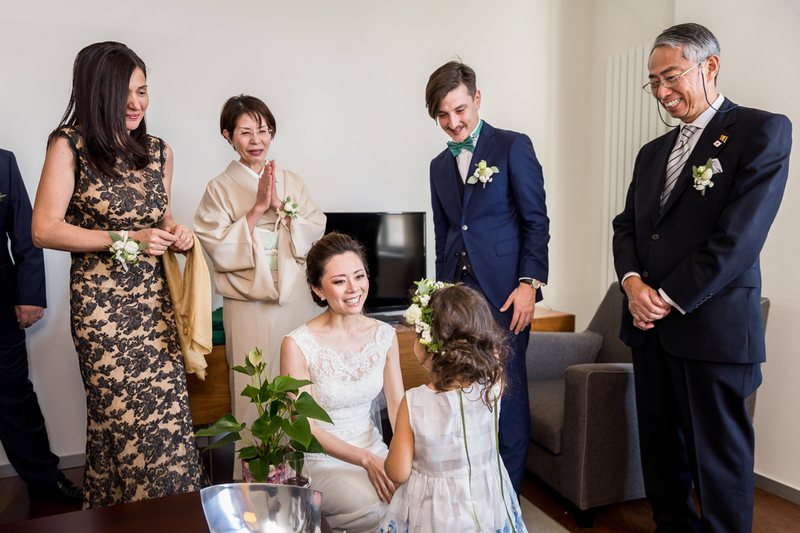 Then, the Shinto service was held: the entire family, dressed in traditional attire, went to a temple, where the couple got their blessings, following the Japanese customs. 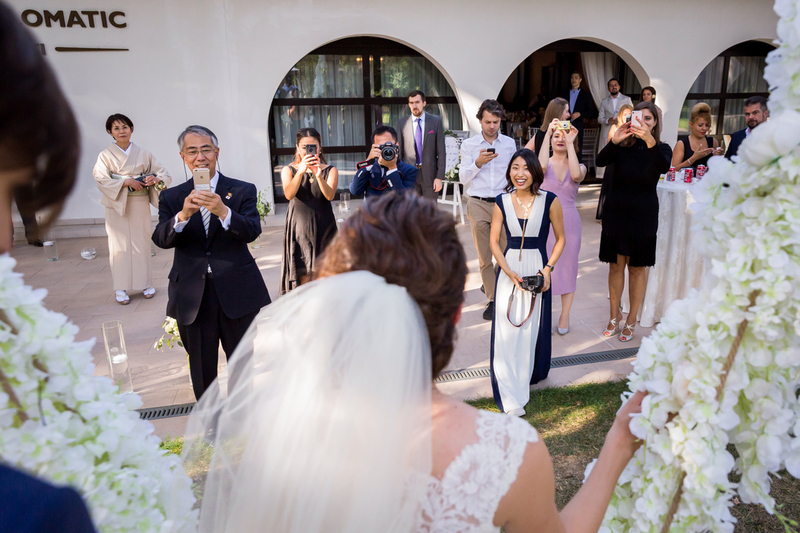 We would have really liked to document that ceremony, too! 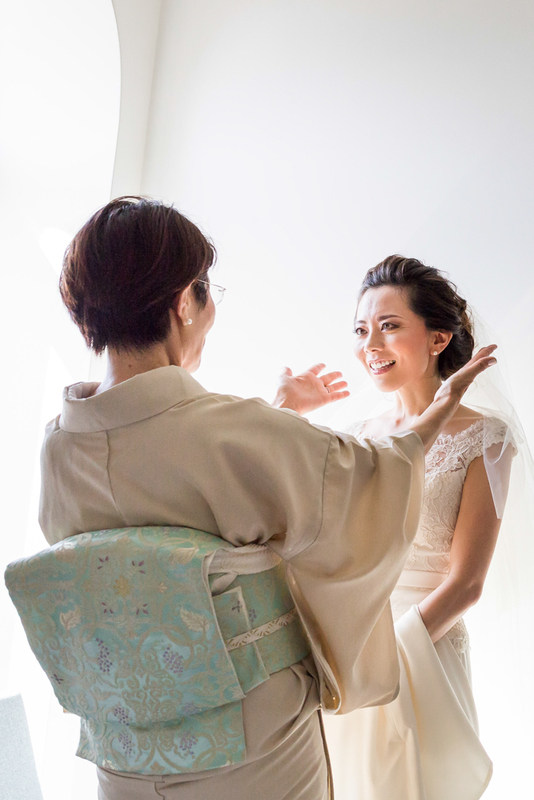 The next step was Yu’s conversion to Eastern Orthodoxy. 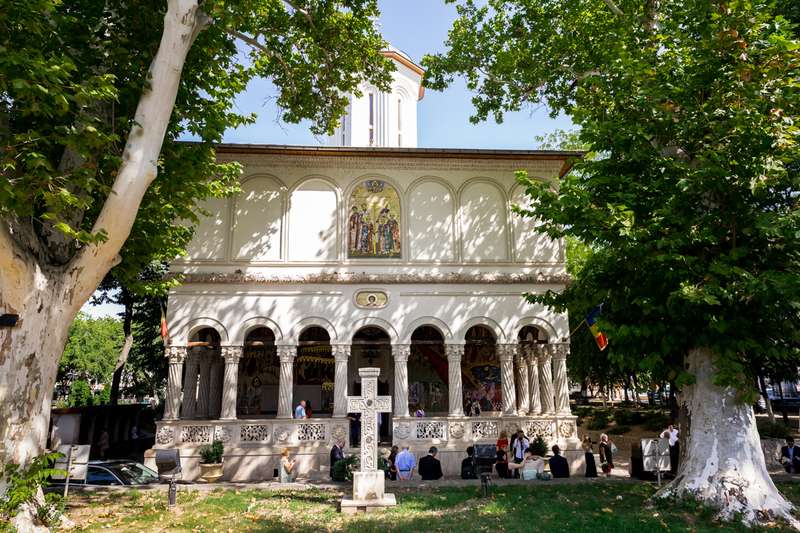 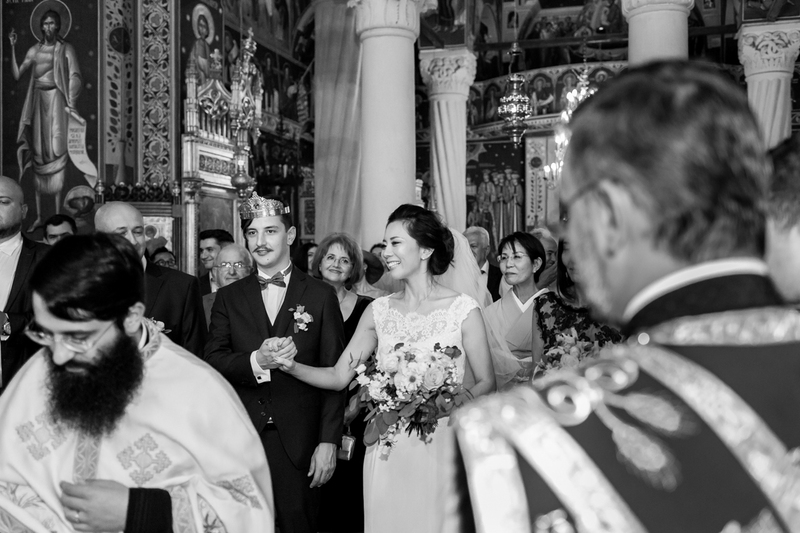 She was baptized in the Eastern Orthodox faith – an incredible experience for her – and was given the name Iulia. 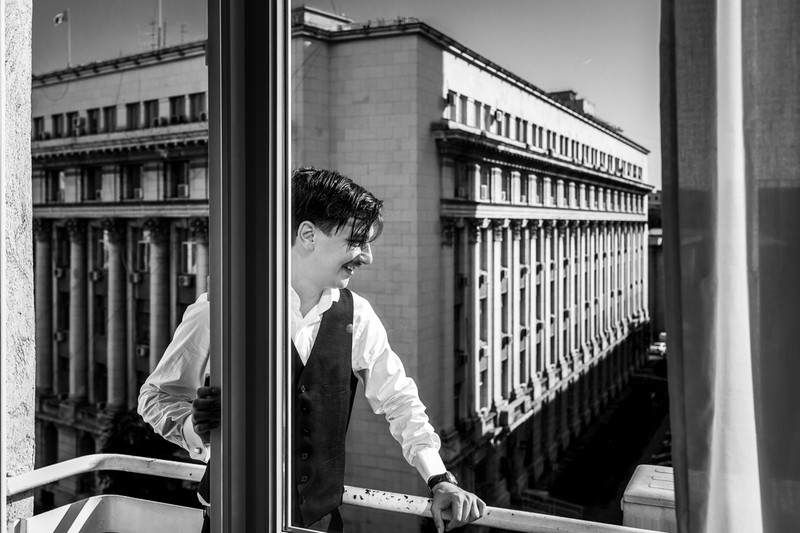 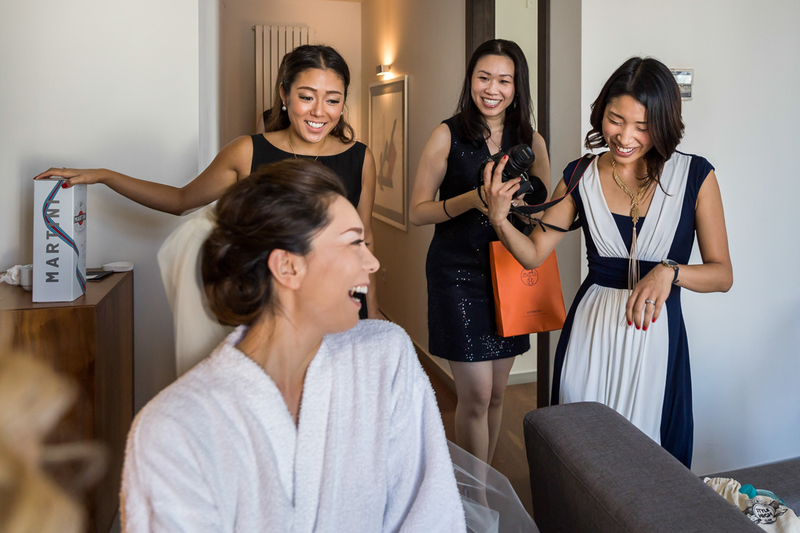 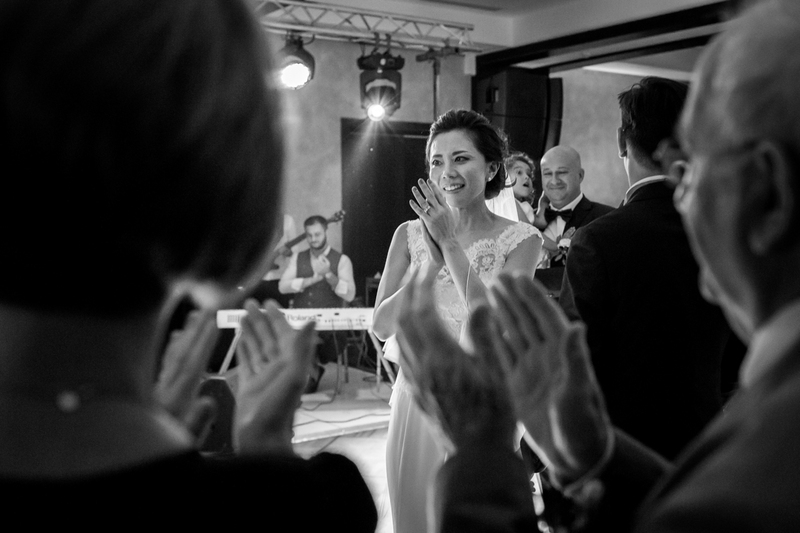 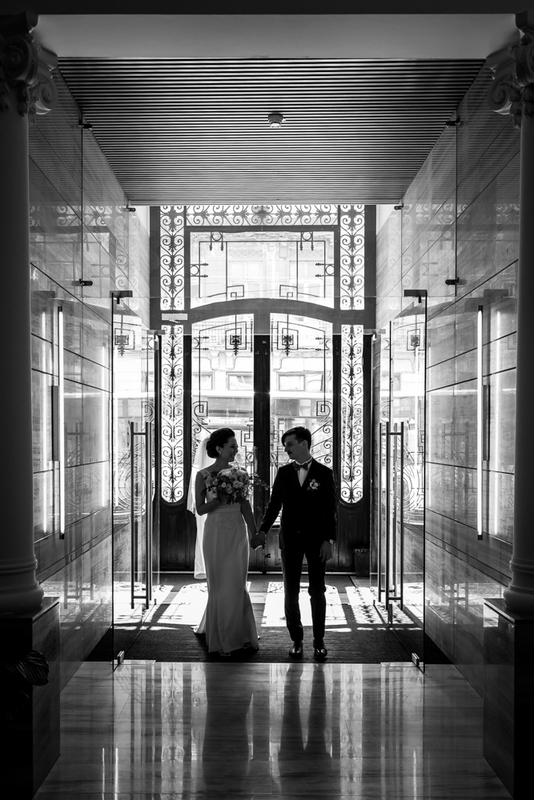 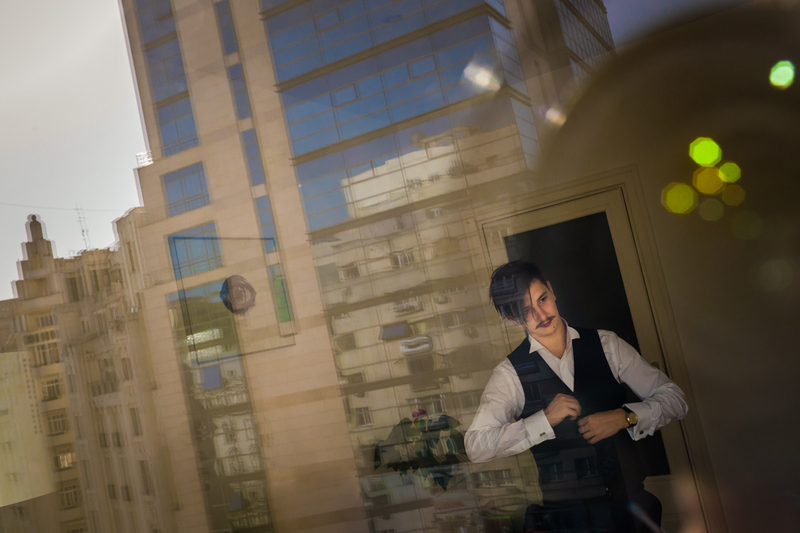 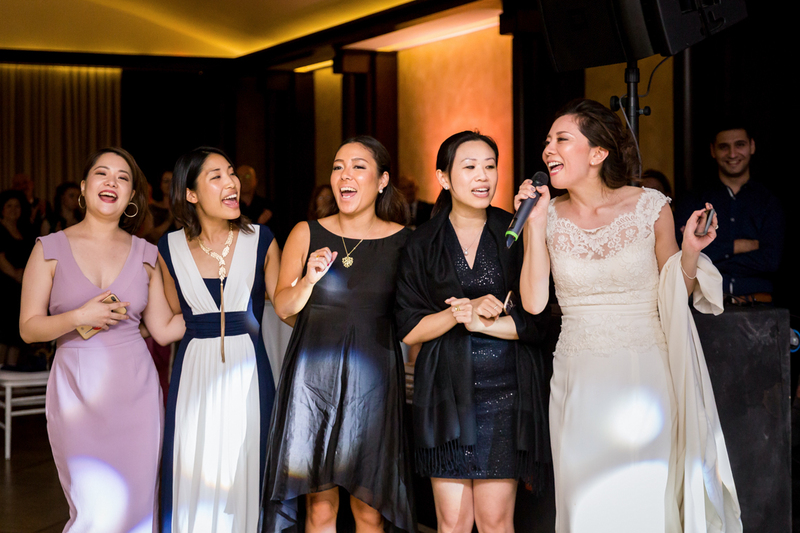 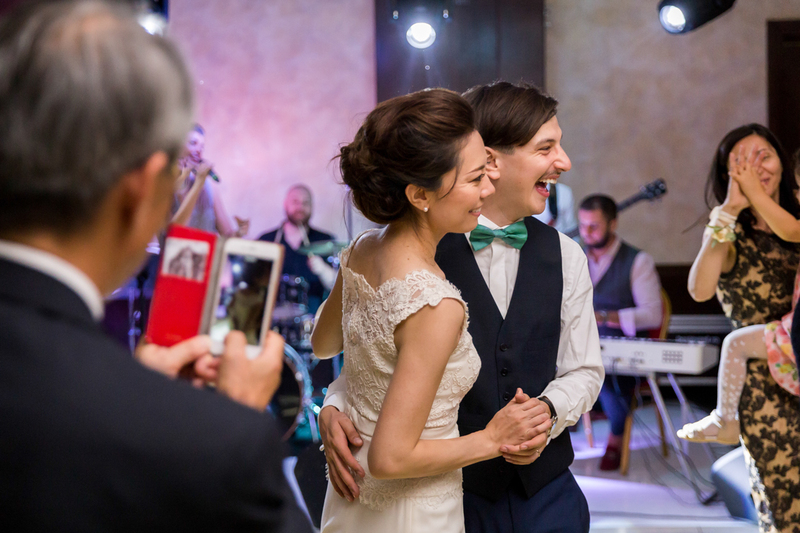 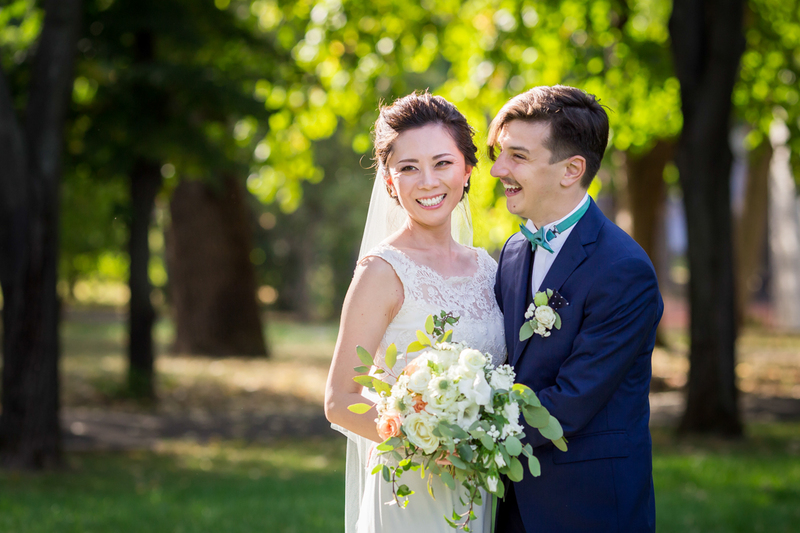 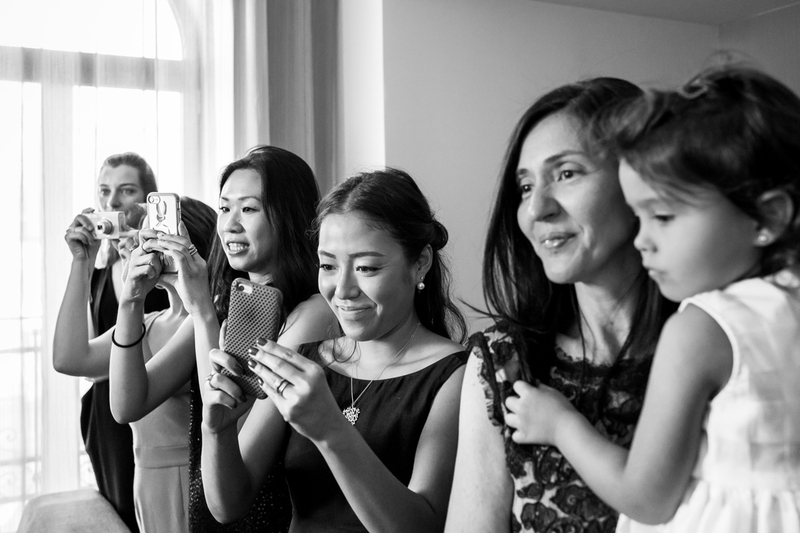 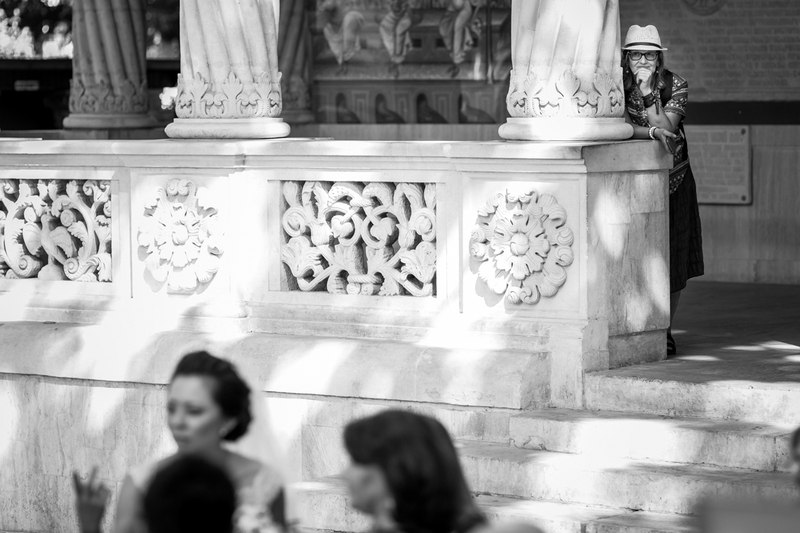 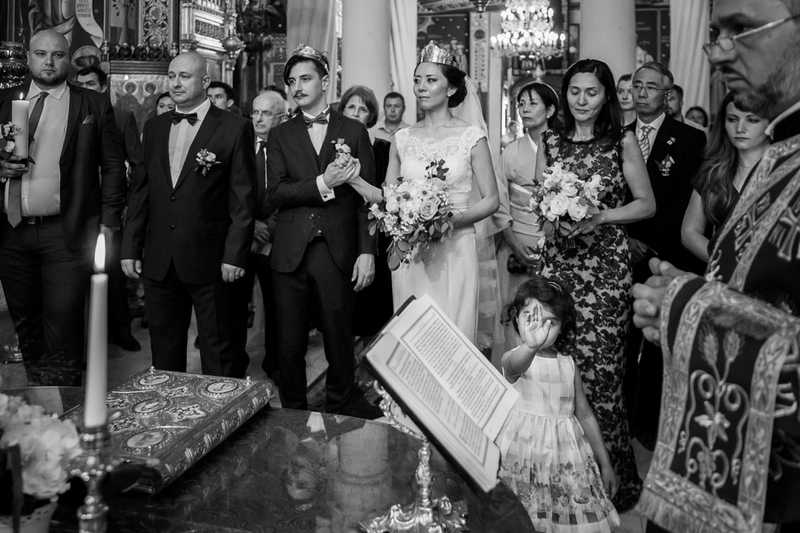 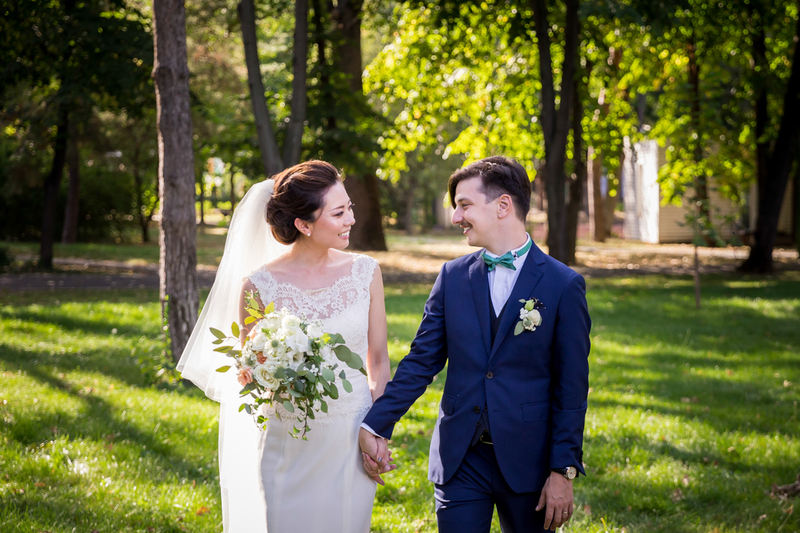 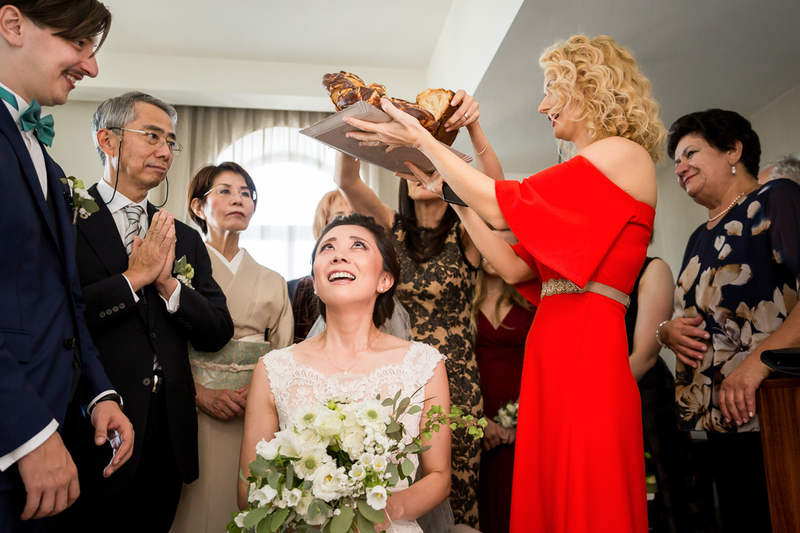 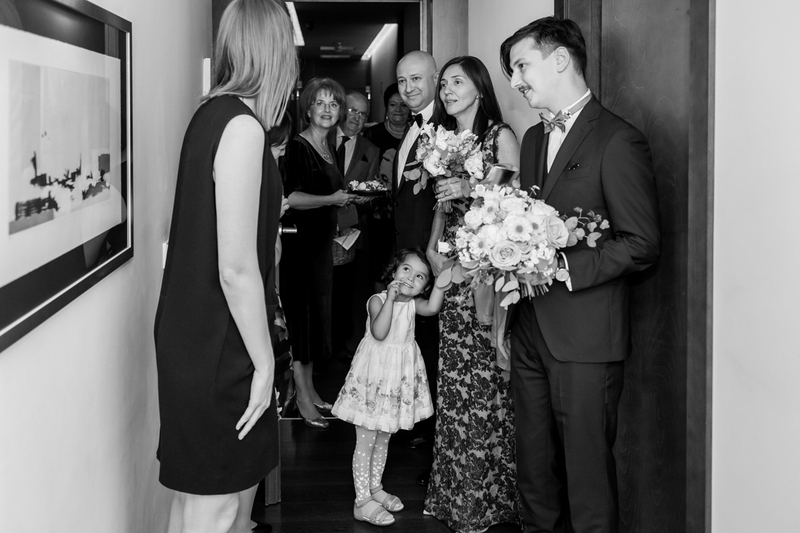 Finally, Iulia-Yu and Ștefan, along with their parents, his sister and their friends, scattered in all the corners of the world, gathered in Bucharest for the wedding. 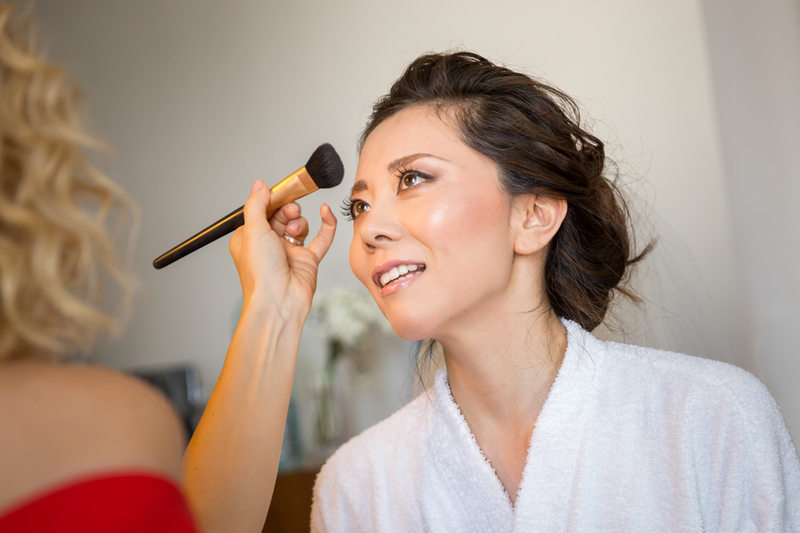 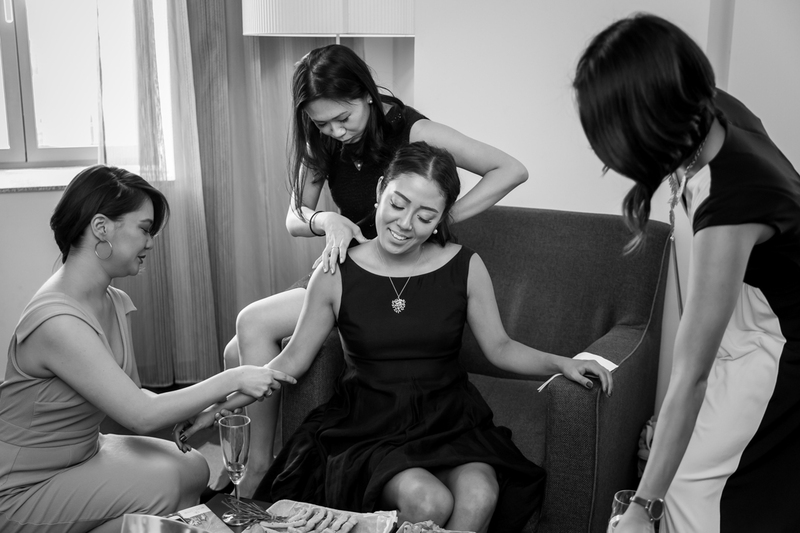 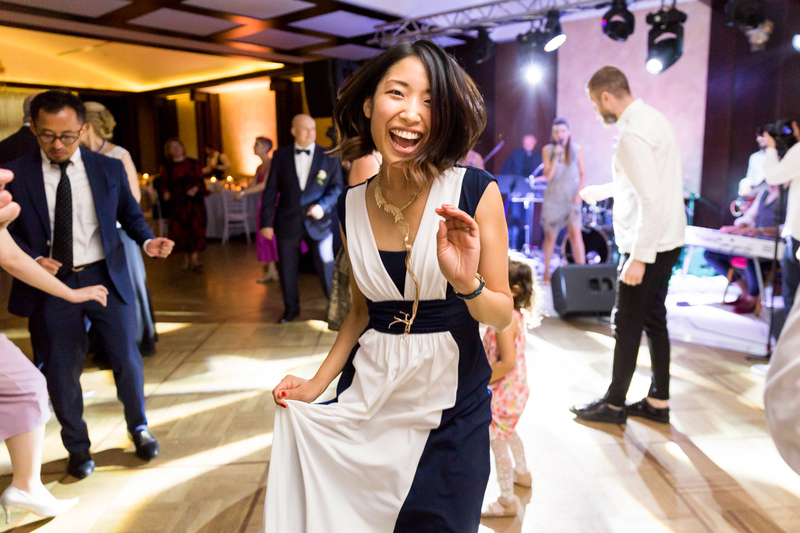 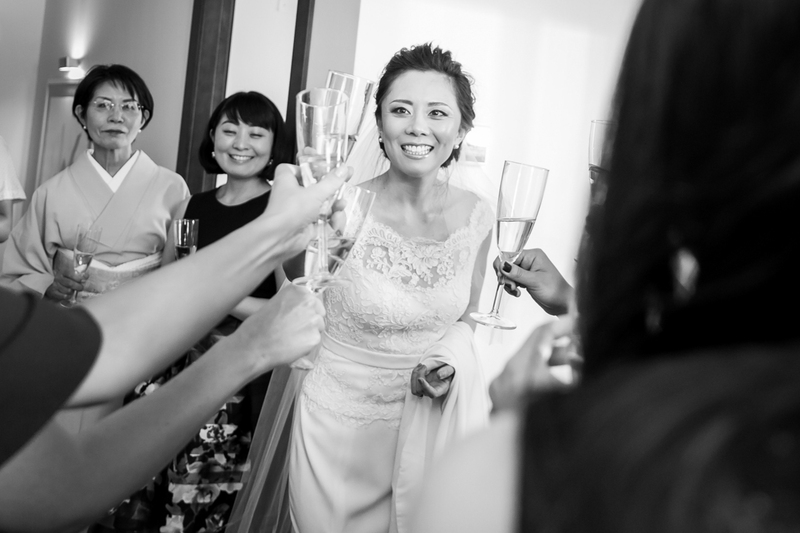 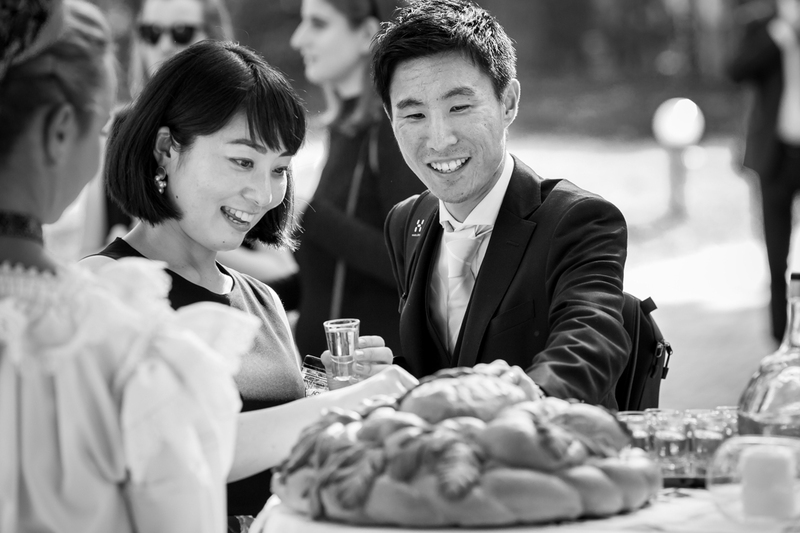 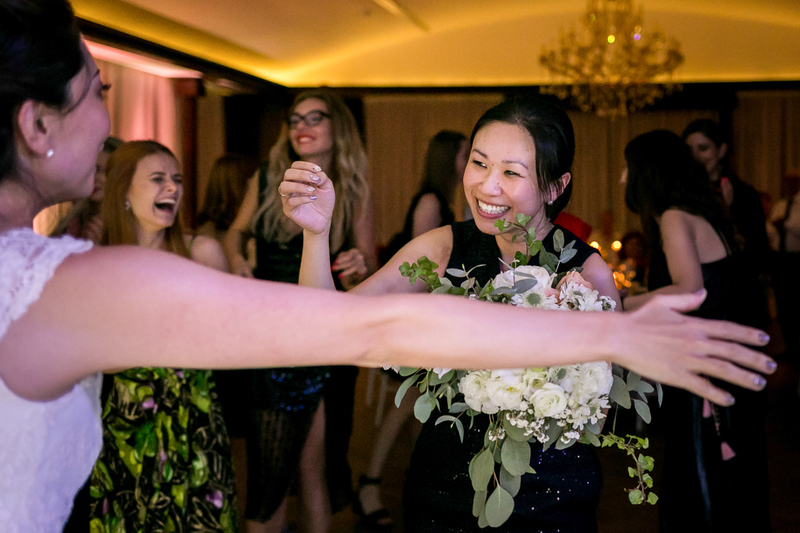 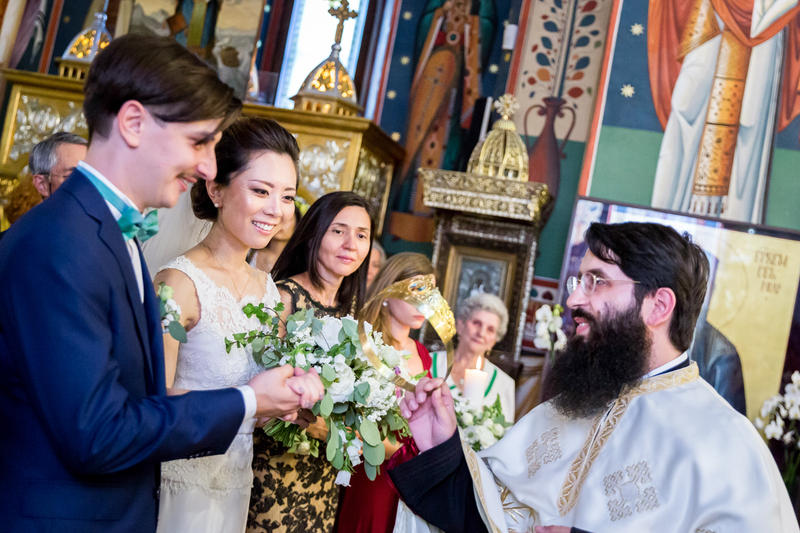 Yu, who wholeheartedly embraced the joy of the baptism and of the Eastern Orthodox marriage ceremony, shone all the way through! 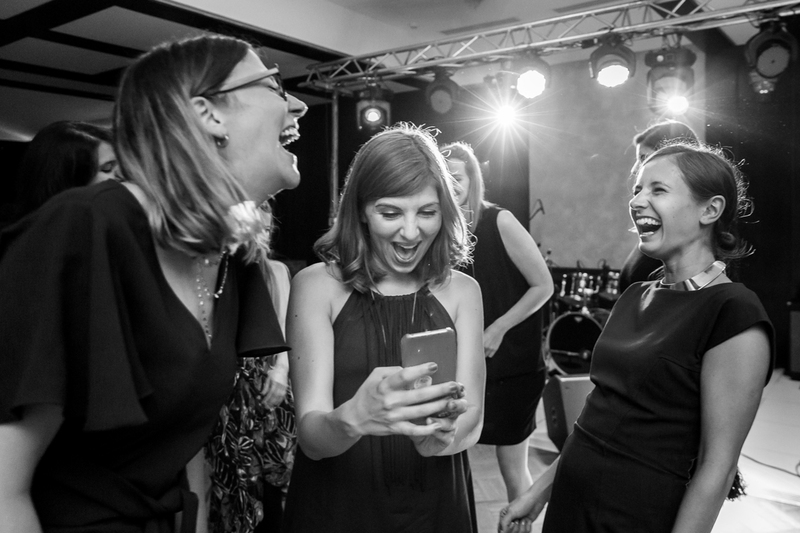 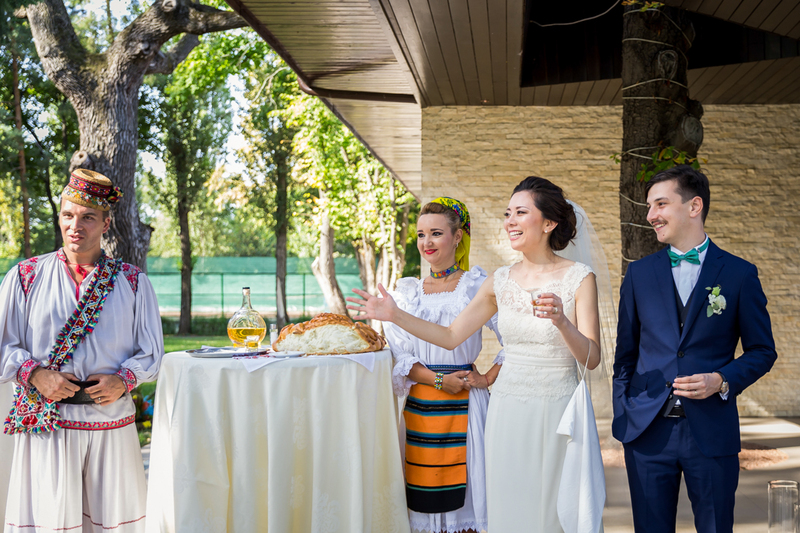 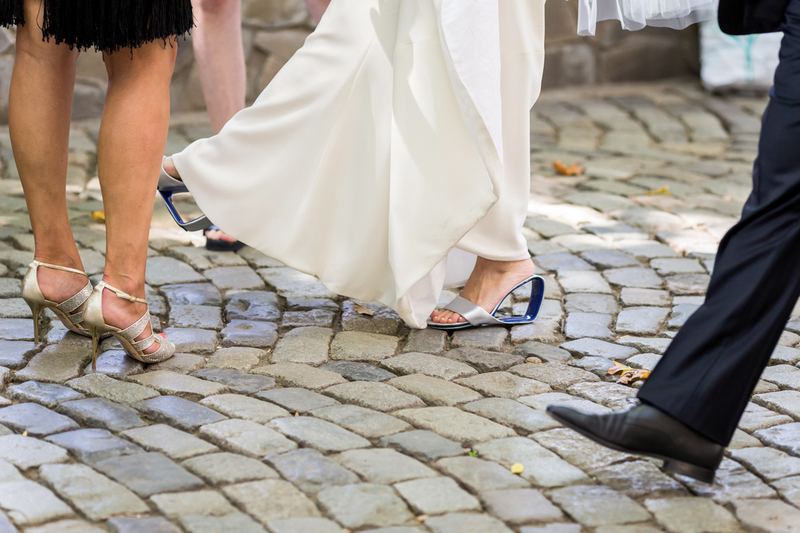 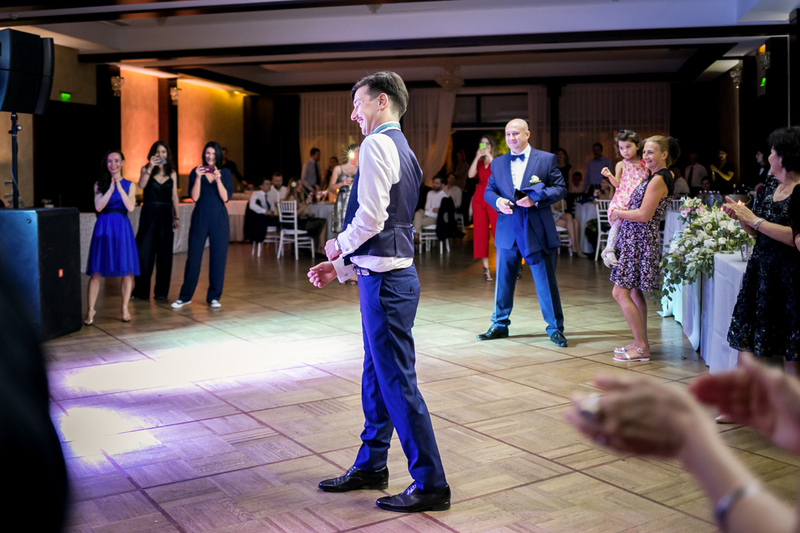 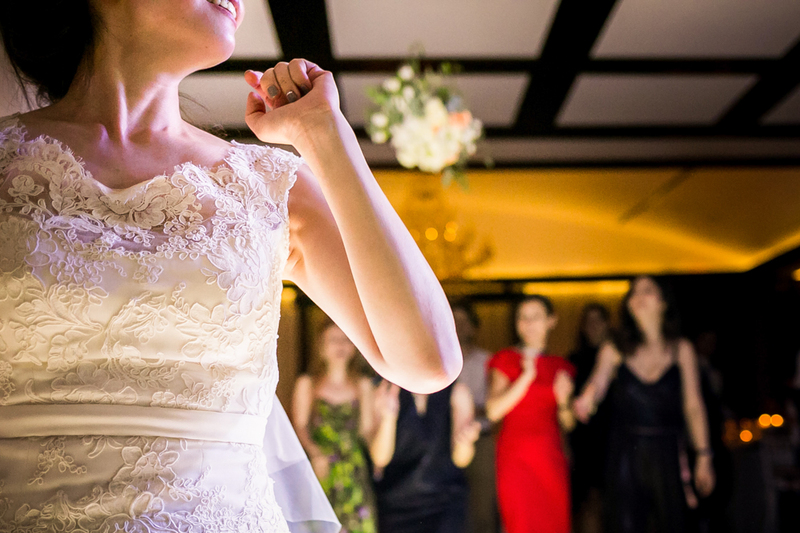 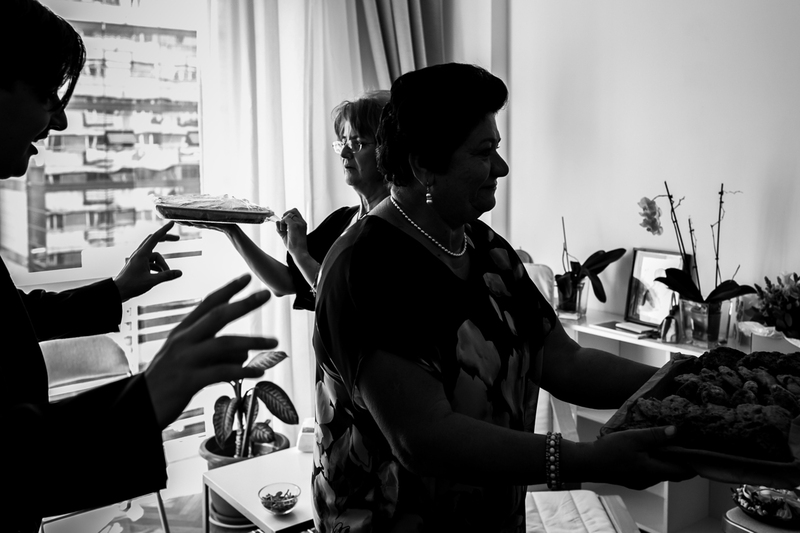 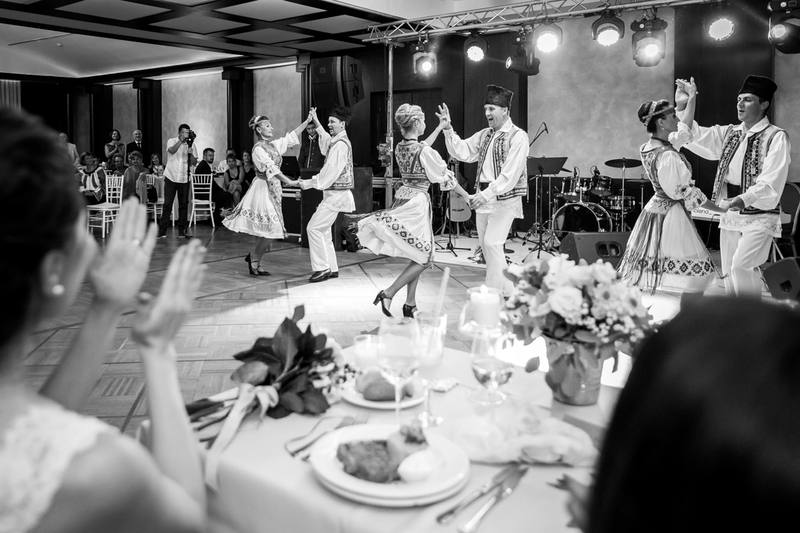 The wedding strictly observed the Romanian tradition, from greeting the weddinggoers with moonshine, bread and salt to stealing the bride – and even the groom (a really fun moment of the night). 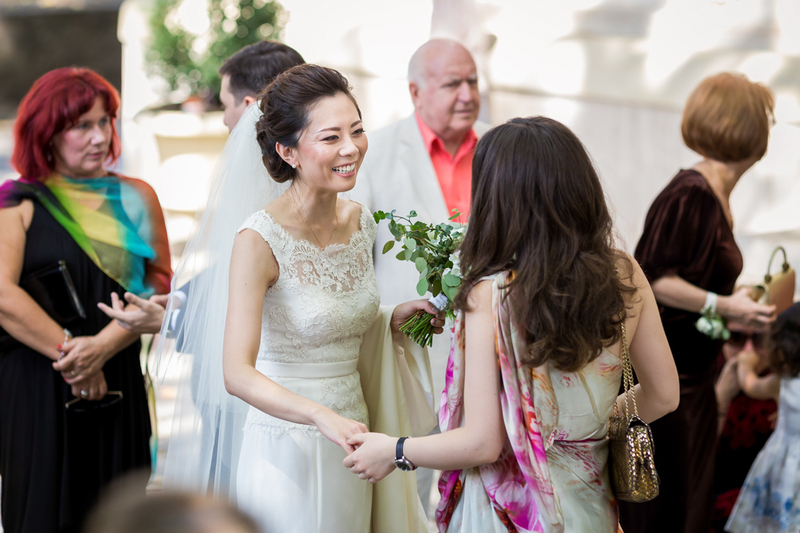 In the end, the bride bade her farewell and exchanged the bridal veil for a married woman’s kerchief. 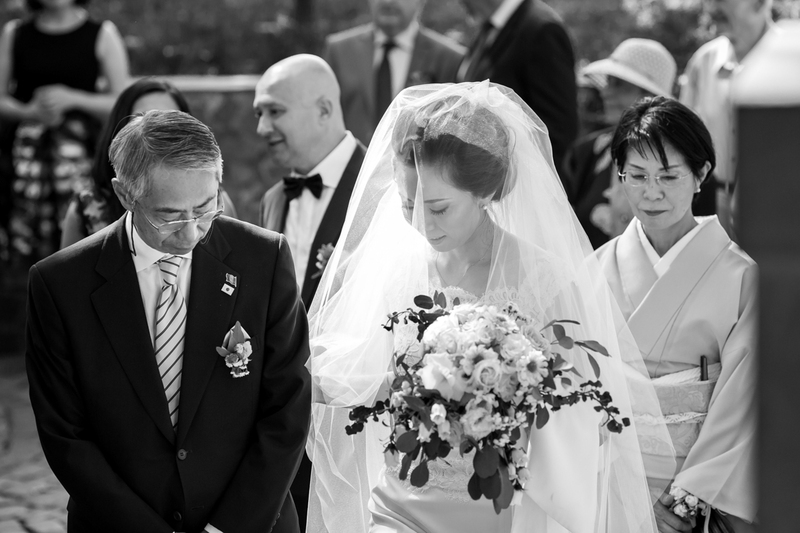 The whole day was a truly special one: the excitement of the parents during the preparations, the astounding Japanese traditional outfits, the hustle and bustle of the close family members and friends, the religious service filled with deep meaning and emotions and a party to end all parties. 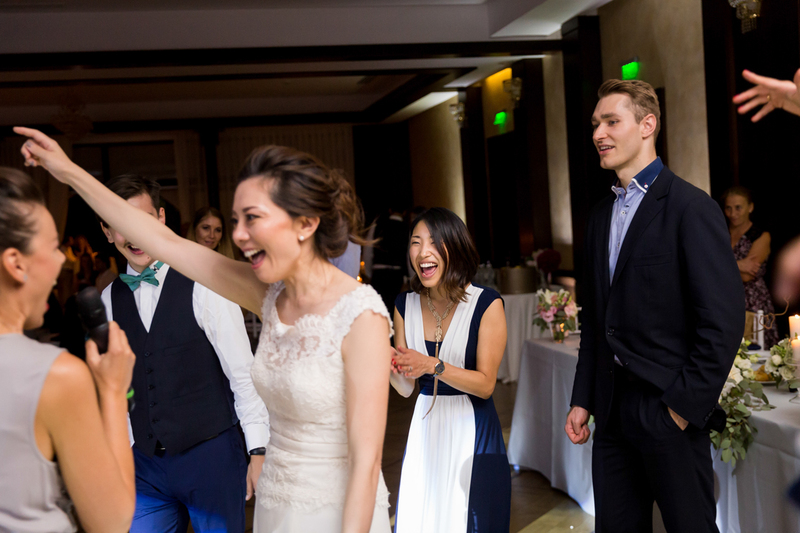 The spouses lived each moment to the maximum and felt as excited as small children must feel before the most tempting toy. 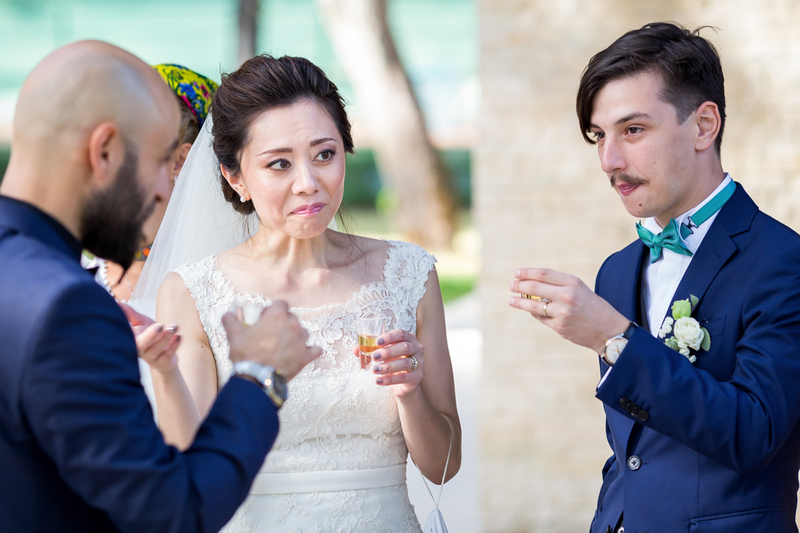 The only thing that didn’t quite go well with Yu was the moonshine: this is one taste that she will need some time to acquire. 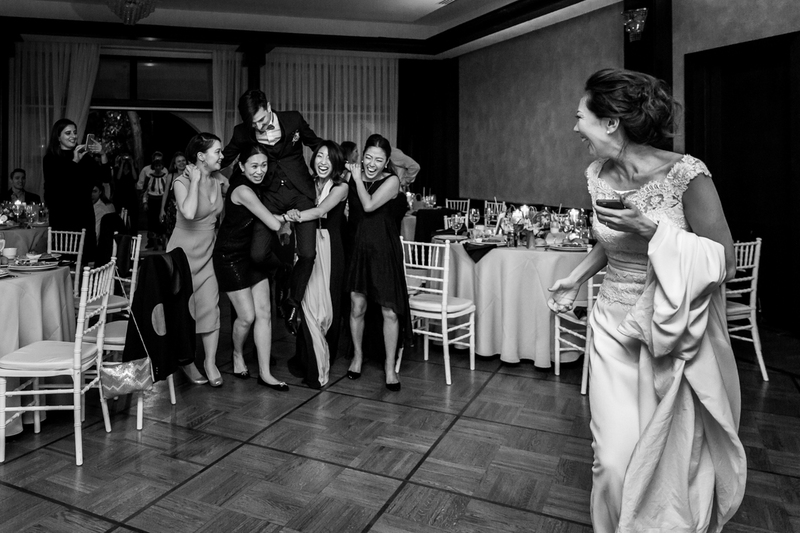 However, the others did not seem bothered by it. 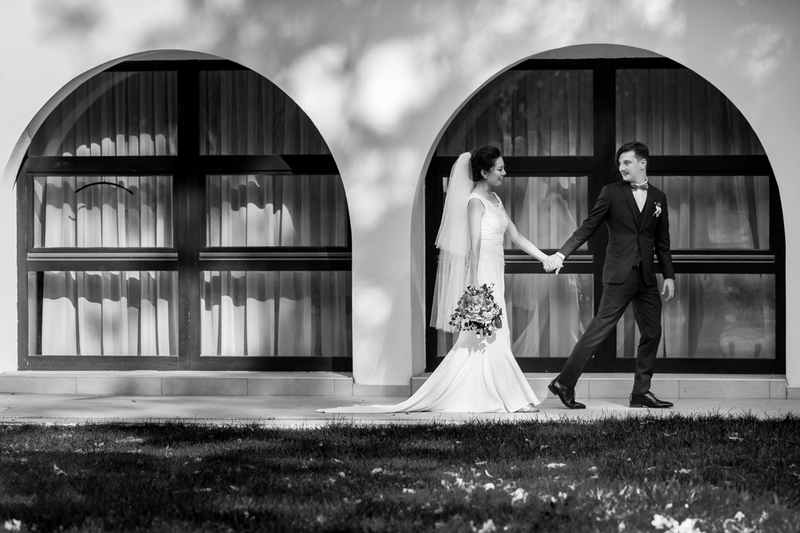 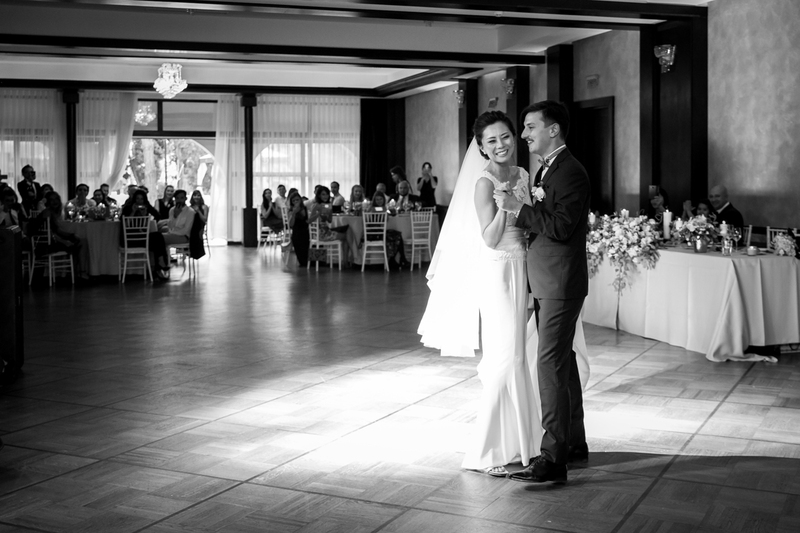 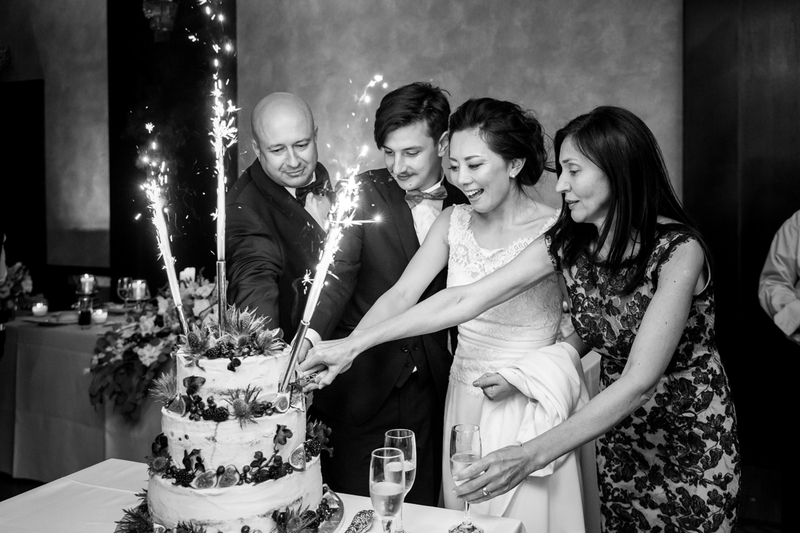 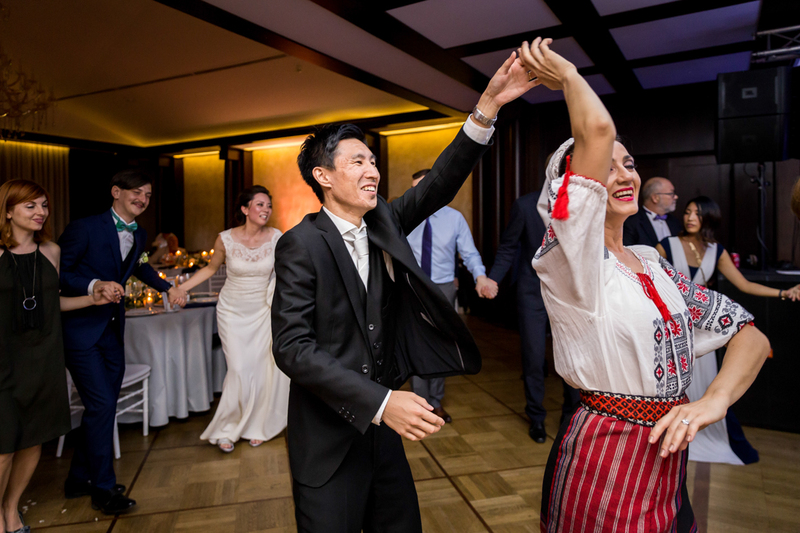 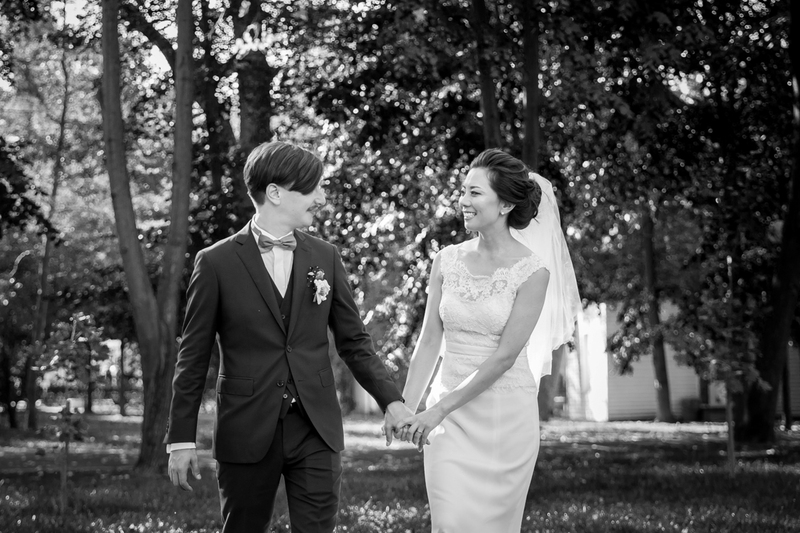 Yu and Ștefan, we thank you for choosing us to be part of this special event in your lives! 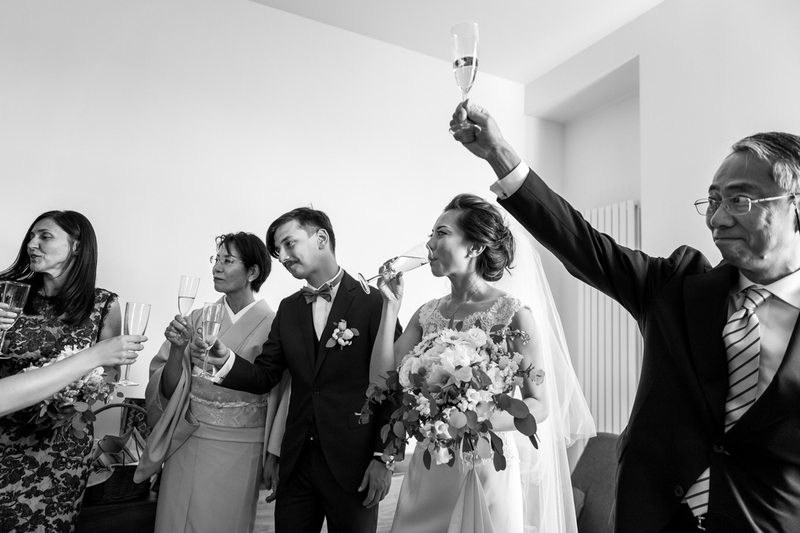 We enjoyed every moment of your wedding day. 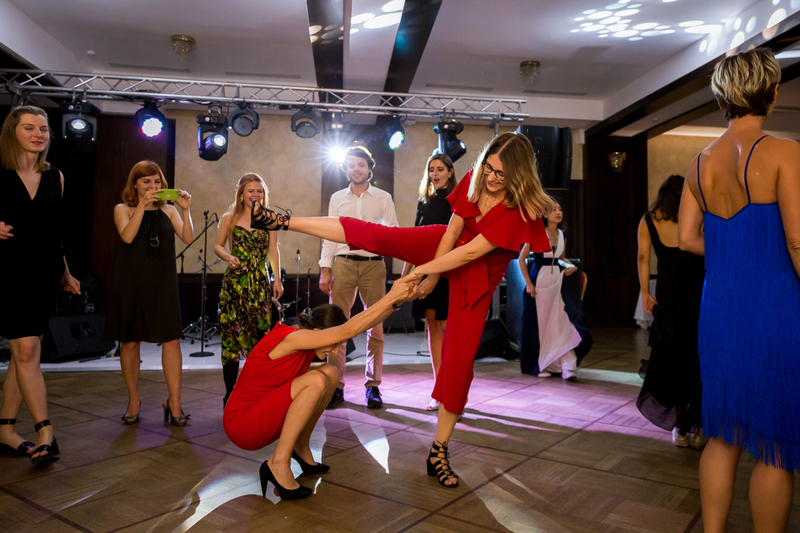 Allow us, once again, to congratulate you on your strength of character! 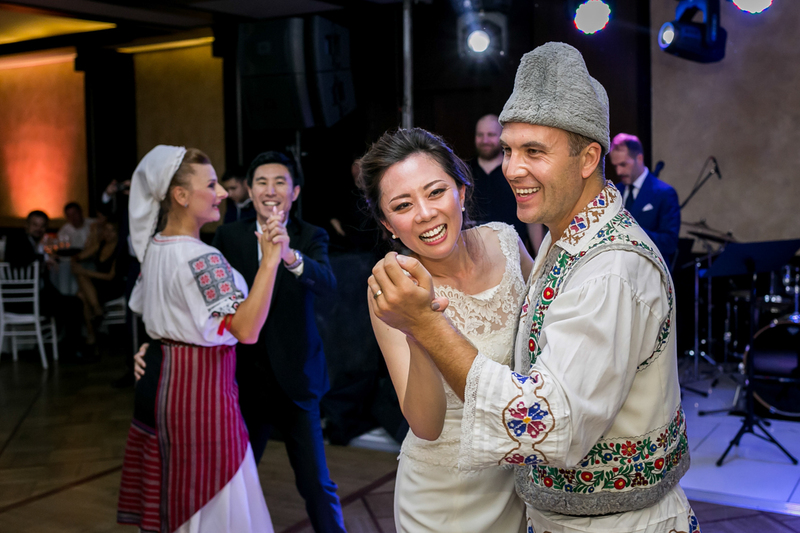 On that day, you managed to bring together the representatives of two cultures that could not be further apart – yet felt so close.